Like many a moviegoer, I enjoyed the hell out of The Force Awakens. But one of the more bizarre choices made in that film was C-3PO inexplicably having a red arm. It was never even explained, despite Threepio pointing it out mere seconds after he first appears on camera. Because they didn’t tell us how he got it, it became a distraction. What’s more, this issue, which finally tells us how he got the arm, was supposed to come out in December. After numerous delays, it’s finally hit comic shops four months after it was originally solicited. On the plus side, it’s a pretty cool story. I’m not sure I buy one of the central concepts James Robinson presents. But the core idea is definitely worthy of the iconic character on the page. Set shortly before The Force Awakens, our story finds C-3PO stranded in the wild with a group of droids. One of them, a First Order protocol droid named OMRI, is their prisoner. OMRI contains information vital to the rescue of Admiral Ackbar, who has been captured and may soon be executed. But Threepio, OMRI, and their companions are more than vulnerable to the elements. It’s not just Ackbar’s life that’s at stake in all of this. Fans of Robinson and Harris’ acclaimed Starman series are obviously in for a treat here, as the band is back together. Visually, this issue is unlike anything Marvel has put out since re-aquiring the Star Wars license. Everything here is much darker, with a lot of heavy inks. On the upside, this issue definitely stands out. Threepio and his robots comrades look great. On the downside, Harris’ style doesn’t lend itself to the richly detailed environments one often sees in a Star Wars comic. Granted, this world looks pretty barren. But I’d still like to be able to see where the robots are. 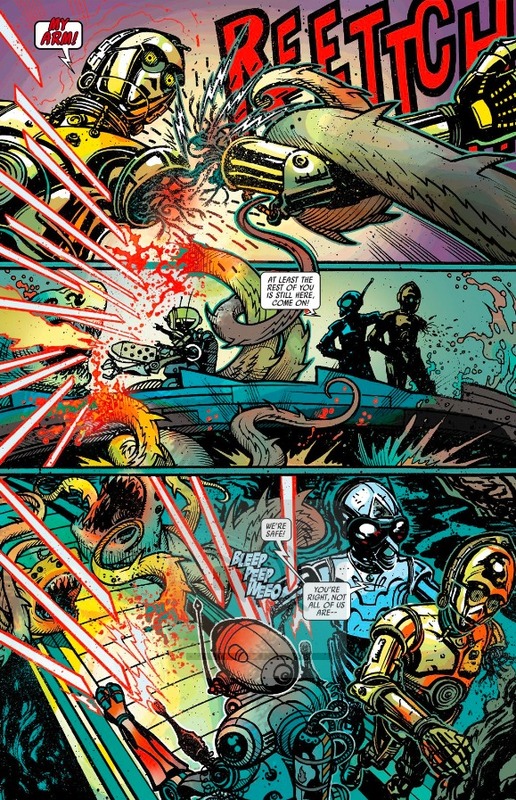 The theme of the issue revolves around the place droids occupy at the bottom of the galaxy’s pecking order. One of the reasons C-3PO and R2-D2 are such prominent characters in A New Hope is so the conflict between the Rebellion and the Empire could be seen from that unusual perspective. The galaxy’s underclass, so to speak. The move was inspired by Akira Kurosawa’s work in The Hidden Fortress. The idea of droids having sentience, personalities, and even referring to having a “life” isn’t new. But the notion of robots being able to remember things prior to a memory wipe is, at least to yours truly. Granted, this is all sci-fi logic. But there’s something I find hard to process about Threepio still having traces of his old memories. If you wipe a computer’s memory, there aren’t select files left over, are there? Unless you have them backed up somewhere…but that’s not what they said! The red arm we see in the movie belongs to OMRI. He sacrifices himself to acid rain (which reveals red a red coat of primer) to save Threepio. While the two droids are on opposite sides, OMRI opts to choose his own destiny. It’s very much a fitting end to a story about robot existentialism. Still, it seems like Threepio and OMRI became friends awfully fast. Especially considering the whole prisoner dynamic. Some of Threepio’s dialogue is also a little irritating, as he has to repeat (i.e. translate for the reader) what some of the other droids say. Lots of stuff in the vein of: “Yes Peewee-Ninety-Nine, I know you’re a military-grade class four security droid. You were quite vocal on the matter earlier.” But it’s very much in character for ol’ Goldenrod. So I can’t fault Robinson for that. 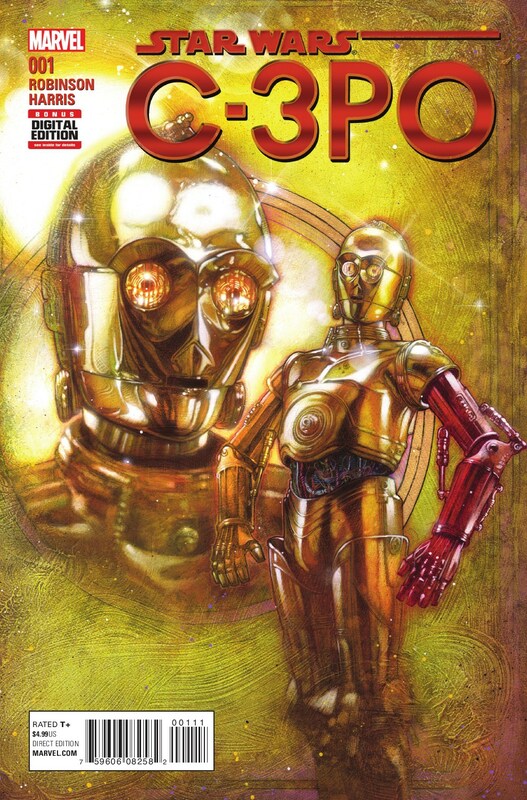 While not flawless by any means, Star Wars: C-3PO #1 is unique. Compared to everything else we’ve been getting from Marvel, it looks and feels very different. Plus, as it answers a pressing question from The Force Awakens, it’s also proven worthy of mainstream press. I can’t say I loved it, but if you’re a Star Wars fan it’s worth picking up. 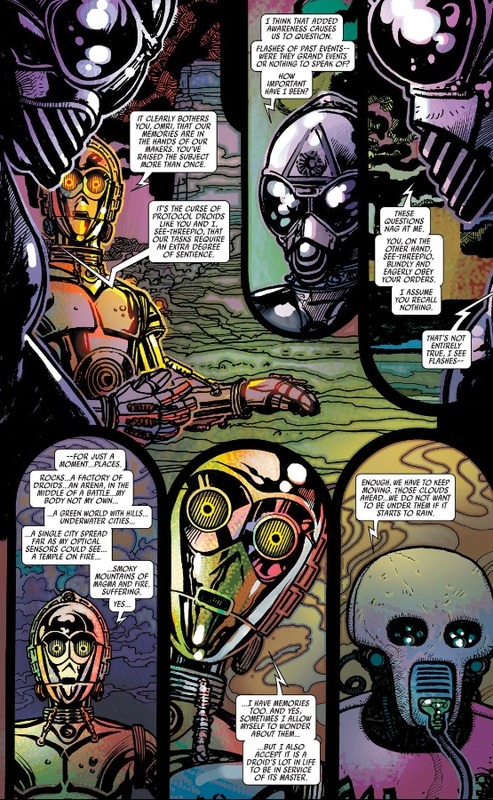 This entry was posted in Comic Books/Graphic Novels and tagged C-3PO, C-3PO comic, C-3PO red arm, comic book reviews, comics, James Robinson, Marvel, single issue reviews, Star Wars, Star Wars comics, Star Wars prequels, Star Wars: The Force Awakens, Starman (Jack Knight), The First Order, Tony Harris on 04/16/2016 by primaryignition.